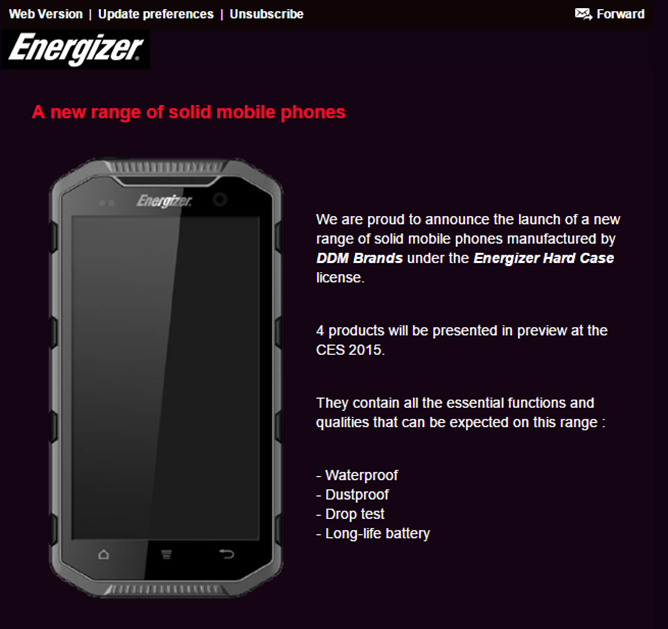 The new Energizer phone is in fact a "range of solid mobile phones," up to four if you believe the PR email sent to us. These will include all of the usual ruggedized qualities: Waterproof, Dustproof, Long-life battery, and "Drop test." Yes, "drop-test" is an essential function here - I'm assuming that the phones will come with an app that will tell you whether it survived the test or not. The Energizer phone (or phones, as the case may be) will probably be distributed by Avenir Telecom, a small company that sells mobile accessories in Europe. Given DDM's current lineup, these will almost certainly be cheap and off-contract devices. 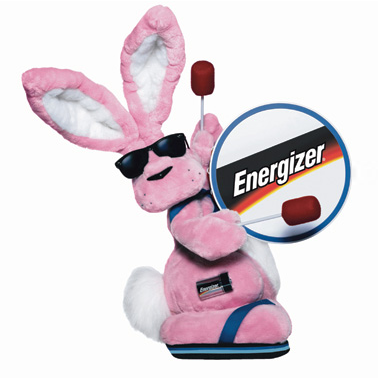 You know, I can actually think of a couple of ways that an enterprising manufacturer could capitalize on the Energizer brand. User-swappable batteries are a natural feature - you could sell Energizer-branded batteries cheap at convenience stores, pre-charged and ready to slide into the back. Or you could engineer a secondary battery bay, perhaps for AA disposable batteries, so users could carry a spare Double-A or two (or steal them from the nearest remote control, like a kid with a Game Boy in 1995) for an emergency charge. You could even design a special charger that integrated Qualcomm's Quick Charge system, perhaps with its own battery so you could top off other gadgets! None of that is going to happen. According to the single promotional image, even the basic navigation buttons are wonky. This will be a cheap, nearly-disposable "smart" phone for people who aren't interested in the likes of Samsung or LG. No one will buy the novelty case that makes it look like the pink bunny with a marching drum. It will be used for calls, texts, and the occasional game of Angry Birds. Perhaps one customer in 100 will actually appreciate the "rugged" design, and the rest will wonder why all those cool new apps won't run on Android 4.1. The Energizer Phone will end its life by spending 18 months in a French resale shop with a price of 15 Euro, right next to a Kyocera Echo and a Microsoft Zune HD. And when no one re-buys it, it will sit in a landfill until the heat death of the universe.